Good King Wenceslas is more than just a popular, jaunty Christmas Carol, it encompasses a true story of a man who was made a saint by the Catholic Church. So, yes, there really was a ruler named Wenceslas. However he wasn’t a king, but instead a duke of Bohemia in the tenth century, and his name in Czech was actually Vaclav. On the other hand, the description of him as “good” is completely justified. He was noted for his piety and devotion to the strengthening of Christianity in Bohemia. The fact that Wenceslaus’ [as his name was spelled at that time], proved to be so virtuous is even more remarkable when you consider his upbringing. His parents were Vratislav I, Duke of Bohemia, and Drahomira, the daughter of a pagan tribal chief, who was baptized at the time of their marriage. In 921 A.D. his father, Vratislav, died, and Drahomira, his mother, took control of the Dukedom as regent. The then 13-year-old Wenceslaus went to live with his grandmother, Ludmila, a devout Christian who imbued her grandson with the true meaning of charity. Drahomira’s pagan upbringing resurfaced with a vengeance. She had never really accepted the Catholic faith, and she now turned against it entirely. She seized her husband’s death as a chance to destroy the religion by purging Catholics from public office, closing churches, and preventing all teaching of the faith. Wenceslas’ grandmother, Ludmila, had to resort to smuggling priests into her house to help teach him. A fierce dispute between Ludmila and Drahomira broke out which only ended on Sept. 15, 921 when Ludmila was strangled by one of Drahomira’s palace guards in her private chapel. Even after this Wenceslas still remained a Christian. He learnt to read and write, something that was unusual for even a King or Duke in those days and had local Bishops smuggled in at night to teach him the Bible. Around 924 or 925 , Wenceslas, now 18, gained control of Bohemia from his mother, at which time he exiled Drohomira and his twin brother, Boleslaus, who was a few minutes younger than him. He is then recorded as defending Bohemia from a couple of invasions by Dukes of a neighbouring regions. Wenceslas was a good ruler and excellent administrator. He introduced an education system and a successful law and order system to Bohemia. It is also evident that Wenceslaus loved Christmas. Every Christmas Eve he and several pages would take food, firewood, and clothing to his most needy subjects, and he encouraged the rich to give to the poor. He became one of the most-loved rulers of his time. One day in 935, just before entering the chapel for his daily prayers, he heard a voice call to him. Turning, he saw Boleslaus approaching. 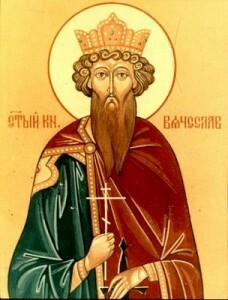 Before he could recover from his shock, Boleslaus’ men stabbed him to death. His last words were, “Brother, may God forgive you.” Wenceslaus was 28, and he left behind him a wife and son. Boleslaus, however was so revolted by what he had done, that he turned away from the pagans who had supported his quest for power. Instead, he spent the rest of his life carrying out the kind of good deeds that his brother had started. Such was Wenceslaus’ renown and reputation that within a few decades of Wenceslas’s death no less than four biographies of him were in circulation. Wenceslas was canonised as a saint due to his martyr’s death in addition to several purported miracles that occurred subsequently. Wenceslas is the patron saint of the Czech people and the Czech Republic. His feast day is September 28. The tune associated with the Carol is much older than the lyrics that accompany it by some 300 to 500 years. It is thought that the tune was originally created in the thirteenth century in Europe, quite possibly in Scandinavia or another northern part of the continent. In the sixteenth century (1582), this sprightly melody was published in the carol collection Piae Cantiones ecclesiasticae et scholasticae veterum episcoporum (in English ‘Devout ecclesiastical and school songs of the old bishops’). It wasn’t until 19th century though that Englishman, John Mason Neale (1818-1866) discovered the tune and in 1853 affixed to it some (fictional) lyrics based on the story of Wenceslas. By that time the historical Bohemian Wenceslas had acquired a whole entourage of legends.